Simmer the ginger, soy sauce and honey in a small saucepan over a low heat for 3 minutes then turn off the heat, add the lime zest and leave to infuse. Once cold, whisk in the juice of one lime, followed by the sesame oil. Set aside. Meanwhile, trim the duck breasts of sinews and score the fat into diamonds. Rub the five-spice powder all over the duck breasts. Place the breasts, fat side down, in a frying pan over a low heat. As soon as the fat begins to melt, increase the heat to medium and fry for about 5 minutes. Flip them over and fry until cooked. The duck will be done, but still pink inside, after 10-12 minutes. Immediately remove from the heat and mix into the soy marinade. Leave for at least 15 minutes. Place the baby spinach, mint leaves and salad onions in a large mixing bowl. When you are ready to serve, tip the marinade juices into the spinach and toss well. 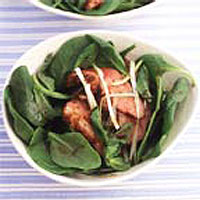 Cut the duck breasts into fine slices and either mix into the salad or arrange on four plates with the dressed leaves. Serve immediately. This recipe was first published in July 2003.